Ahead of the January 2018 update on the report “3D Cell Cultures: Technologies and Global Markets,” we are resharing Laurie Sullivan’s blog from July. On January 24, 2018, the analyst Robert G. Hunter will present a Member Exclusive Webinar and Q&A session on this report. Purchase the report or become a Member to attend! 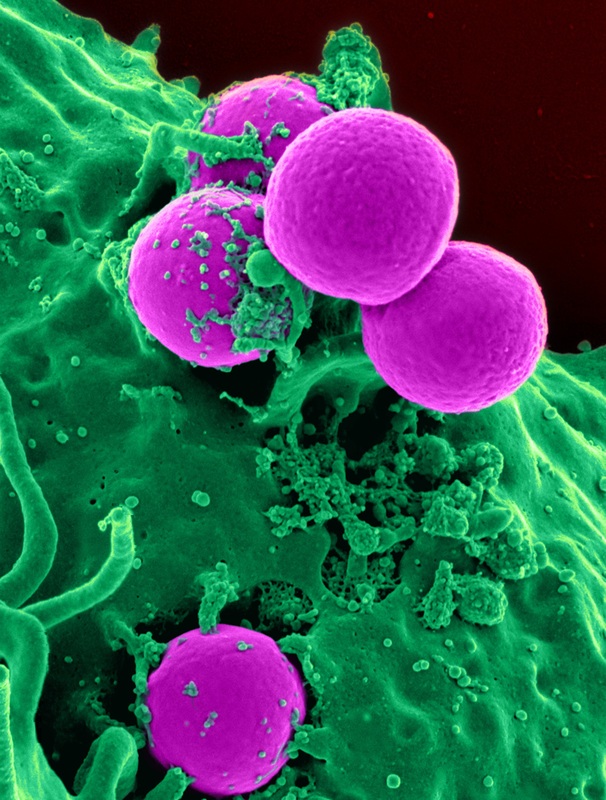 Fast-moving developments in 3D cell culture tools and technologies are accelerating cancer research and its clinical applications, as well as other areas of medical research and safety applications. 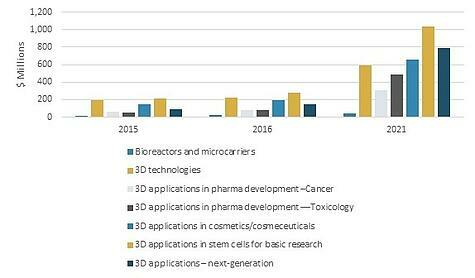 BCC Research forecasts some segments of the global 3D cell culture market to have five-year compound annual growth rates as high as 44% through 2021 (e.g., 3D applications in toxicology for pharmaceutical development). In another example, neurological safety testing could grow from being a $5 million segment in 2015 to $95 million by 2021, according to BCC Research’s study, 3D Cell Cultures: Technologies and Global Markets. New cell culture products and applications are proliferating even faster than was predicted in BCC Research’s 2015 report. Companies including Thermo Fisher, GE Healthcare, Merck Millipore, and a range of start-ups and spinouts are pursuing diverse market segments, from cosmetics and skin care, to cardiac toxicology and metabolic reactions, to new drugs. The new 3D technology allows for groundbreaking visibility into tissue and cancer behaviors in the body compared with animal testing or more general 2D (in vitro) technologies. Existing 2D models are less representative of human physiology and have contributed to late-stage product failures due to adverse events. Many also believe that 2D models have been a contributing factor to anemic pharma pipelines in general. As a result, 3D systems are gaining market share quickly. There are significant implications for mental health studies and drug therapies for which animal testing has shortcomings, e.g., for conditions such as Parkinson’s disease, Alzheimer’s disease, or depression. The market for next-generation cancer therapies using these tools was estimated at $50 million in 2015, and it could grow to more than $300 million in the United States by 2021. “The standards and best practices emerging in precision cancer care, as well as new findings in CNS research, could certainly speed up patient-centric care. Some call it personalized medicine or precision medicine, and it really is a revolution compared with developing mass-market drugs. We are already seeing the impact that stem cells and other tools are having as the result of 3D cell culture technology,” says Robert G. Hunter, Senior Healthcare Editor at BCC Research. In two decades, 3D printing has grown from a niche manufacturing process to a $2.7 billion industry. 3D printing is now being applied in cell biology to print cells and build tissues. Organoids are 3D structures initially composed of embryonic stem cells that mimic the tissue, including some of the structure and function of natural organs. Organoids are useful as disease models and drug screening platforms. Because organoids are grown from stem cells taken from an individual, they have the genetic characteristics of that person. This means that they are useful models for developing drugs for personalized medicine applications. Important requirements for organoids to more fully function like natural organs include complexity, maturity, and reproducibility. Most organoids are relatively simple single tissues, which limits their usefulness as models. However, by using embryonic stem cells, which have the ability to transform into almost any cell type, more complexity can be created. In order to create more realistic replicas of human organs, this complexity (e.g., more cell types and larger construct size) is desired. The importance of organoids to the cell culture model industry is exemplified by the Human Cancer Models Initiative (HCMI), which began in July 2016. The goal of HCMI is to develop a large bank of cancer cell culture models that will be available to the worldwide research community. More than 1,000 cancer cell models are envisioned. The consortium will use the latest 3D cell culture tools to construct models that more closely mimic the tissue architecture and complexity of tumors than is the case with cell lines used presently. Key participants in the HCMI include the National Cancer Institute, Cancer Research UK, Wellcome Trust Sanger Institute, and Hubrecht Organoid Technology. Bioprinting is particularly useful for cancer models because of its ability to introduce complexity into the organoid. Cancer tumors consist of heterogeneous cell compositions and complex microenvironments. As the cancer progresses through its stages (genesis, development, metastasis), multiple complex interactions occur. These include cell-to-cell as well as cell-to-extracellular matrix interactions. Conventional 2D and 3D models do not have good vascularization and have trouble duplicating the complexity of tumors. Thus they cannot be used widely for cancer studies or drug screening. Bioprinting can provide complex 3D structures, resulting in more accurate cancer models. Due to these advantages, bioprinting of organoid structures is expected to play an increasing role in disease modeling and therapeutic development over the next five years. NASA has been 3D printing in space on the International Space Station since the first 3D printer in space arrived in 2014. The space organization is now investigating the uses of bioprinting in space, with its team at the International Space Station working to improve on its technique, beginning with handling. The lack of gravity lends an extra challenge to research that is already complex. The current goals with bioprinting at the International Space Station are to 1) reduce loss of cells from cultures, 2) create cultures in specific shapes, and 3) improve retrieval of cells for use in analysis. “In the microgravity environment, cells exhibit spatially unrestricted growth and assemble into complex 3D aggregates, in contrast to typical growth in monolayer (2D) cultures as occurs on Earth. For over two decades, investigations conducted in space and on Earth have shown that 3D culture supports the generation of tissue-like characteristics in vitro that are more biologically representative of native in vivo–like cell growth and function,” state the researchers.